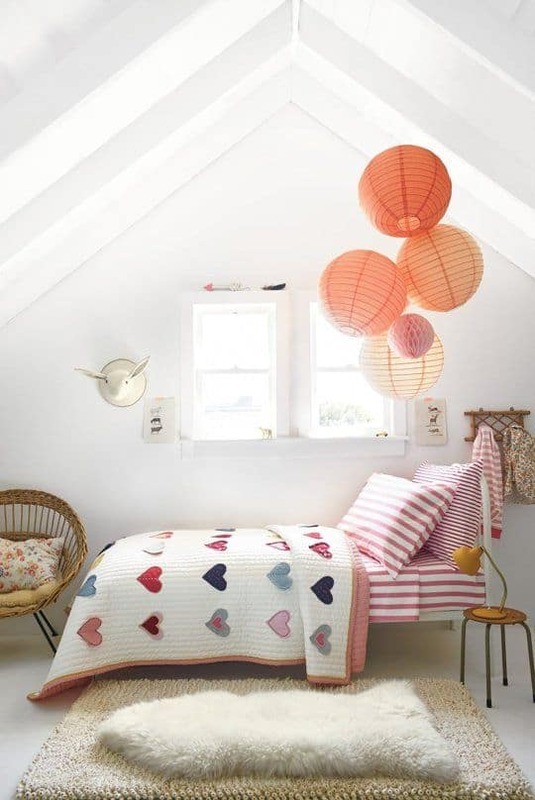 There is something so fun and liberating about decorating a kids room. You can go wild with colors and patterns. You can use toys as decor. Make it whimsical and romantic. Or make it masculine and modern. They all work in their own special way. 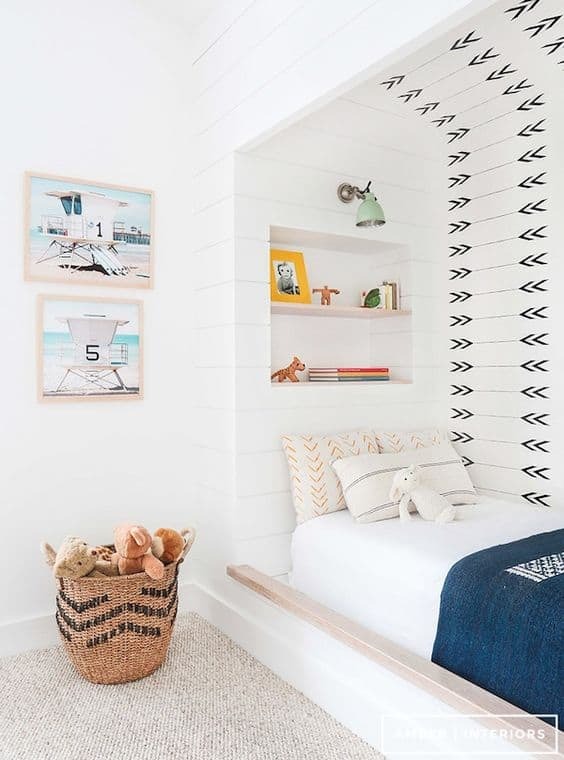 I’ve been seeing some amazing kids room ideas lately on Pinterest and I’m here to share these beautiful rooms and ideas. Trust me. They’ll make you want to be a kid again. All images sourced at the bottom of the post. 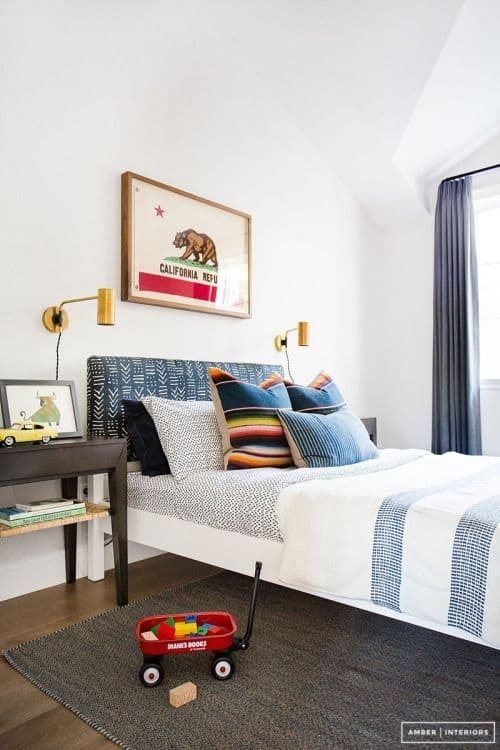 What makes a kids room so fun but look so put together at the same time? Oh yeah, and functional. We will get to that in a bit. I sat here studying some of these popular kids room images. I’ve narrowed it down to some really fun accessories that give it that pop! 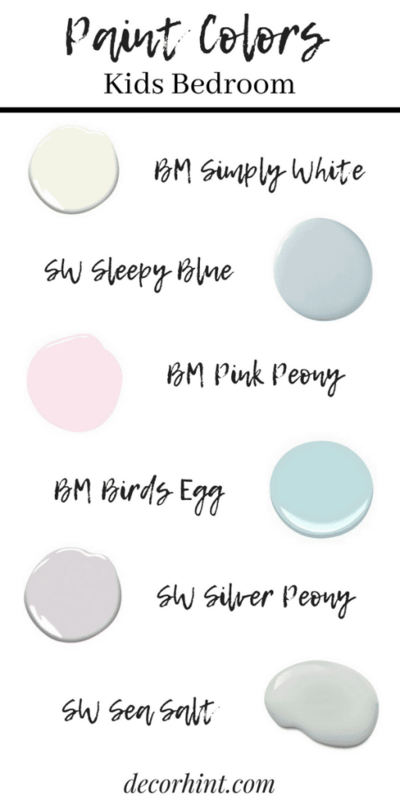 Plus – I’ve included some popular kids room paint colors and tips to improve the overall functionality of the room. 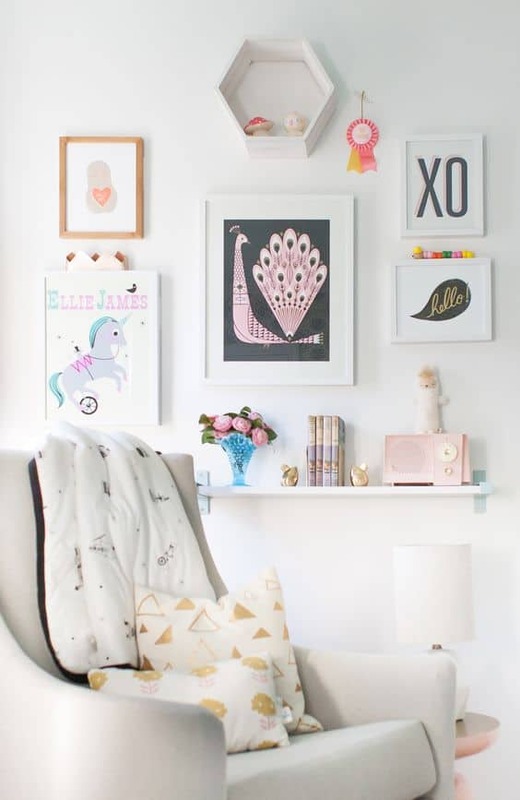 Whether it’s a gallery wall of fun prints or a single statement piece of art, kids rooms make the best blank canvas. Art is a personal choice, but here are some good options that are popular to get the wheels turning. If you are thinking about going with a gallery wall – what’s the easiest way to make it look cohesive? Keep everything in the same color family. So for instance, go for all black and white prints (abstract, typography, photography) but then vary the frames. Maybe a gold frame, maybe a wooden frame, maybe a white frame etc. In different sizes of course! Favorite sources for the coolest, cheapest, most amazing art prints? Your own kids! Kids artwork framed up can look fantastic. Society 6 is great too. 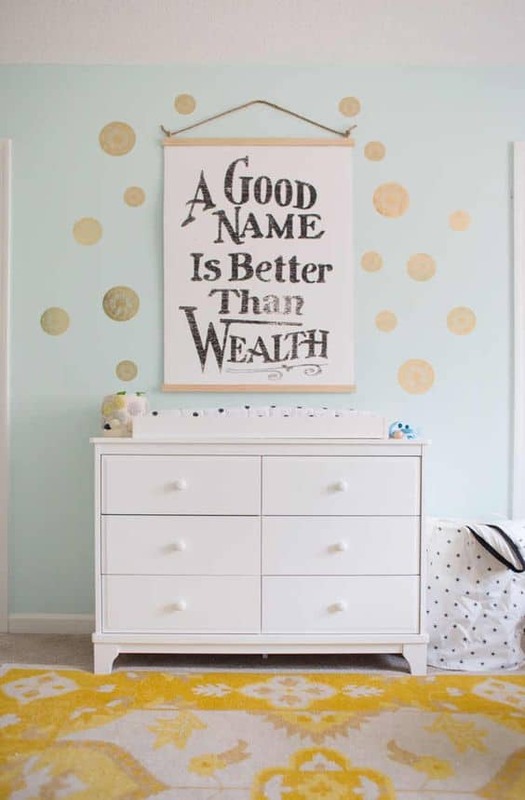 Minted – great one of a kind artwork! Sometimes all we need is a sophisticated rug to pull a room together. Or use one as a jumping off point for pulling in other colors. I love bright pinks, yellows and blues but I also love rugs in muted, dusty tones. I think every room needs a timeless piece that gives it a collected feel. 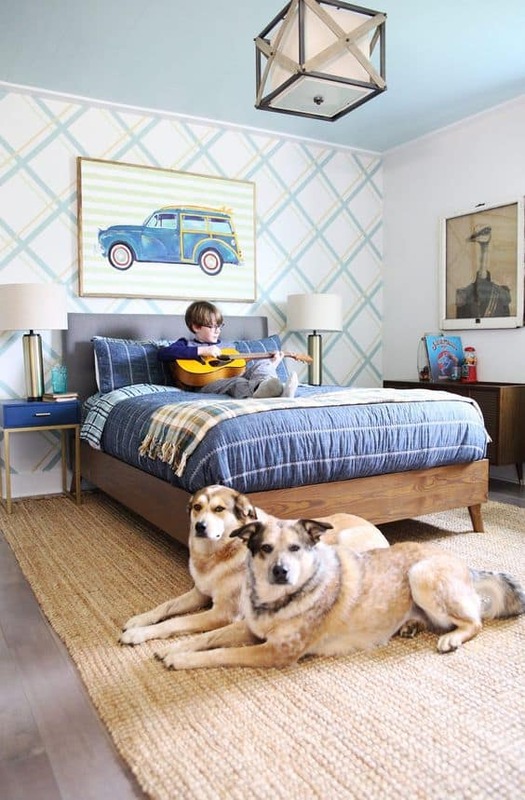 And with kids rooms, the collected look can be hard to achieve. Vintage rugs give you that feel though. Striped rugs are totally timeless and will never go out of style. You can always find a place for a nice striped rug. If you have carpet in a room, you can easily lay the rug down over it. Changes the whole room! 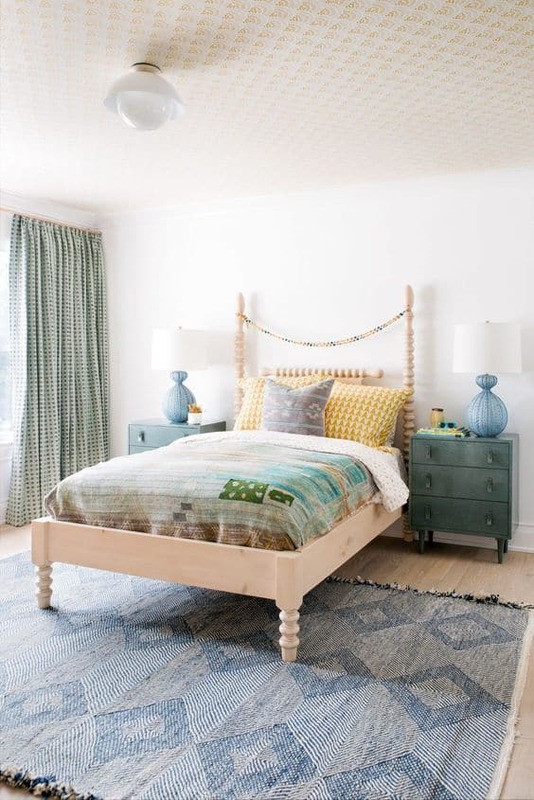 I also LOVE how a vintage rug adds both color and pattern to a room. And you don’t have to go expensive! 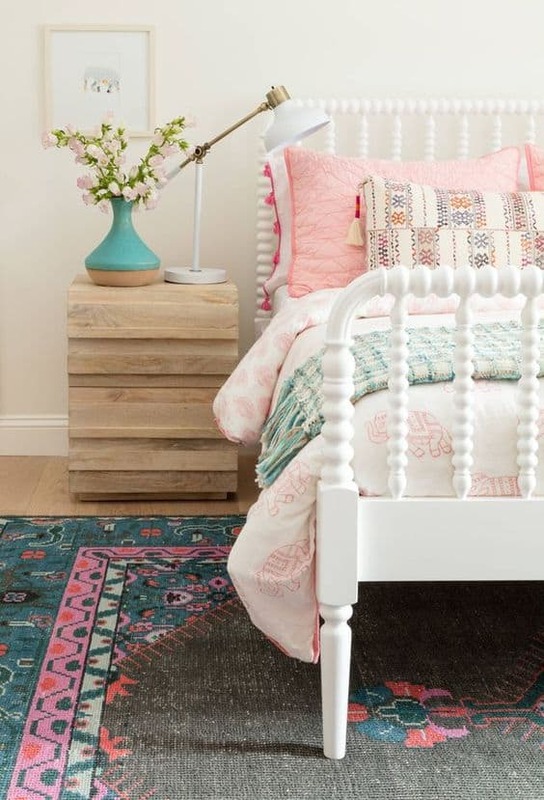 Target – Opalhouse rugs have the best pattern and texture in my opinion. Great quality for the price. Target – this rug is AMAZING. Or go for an striped outdoor rug and lay a cushy, washable sheepskin throw (this one is machine washable too!) on top for comfort and added texture too. A lot of these rooms have wallpaper! Or decals! Or accent walls of wallpaper. 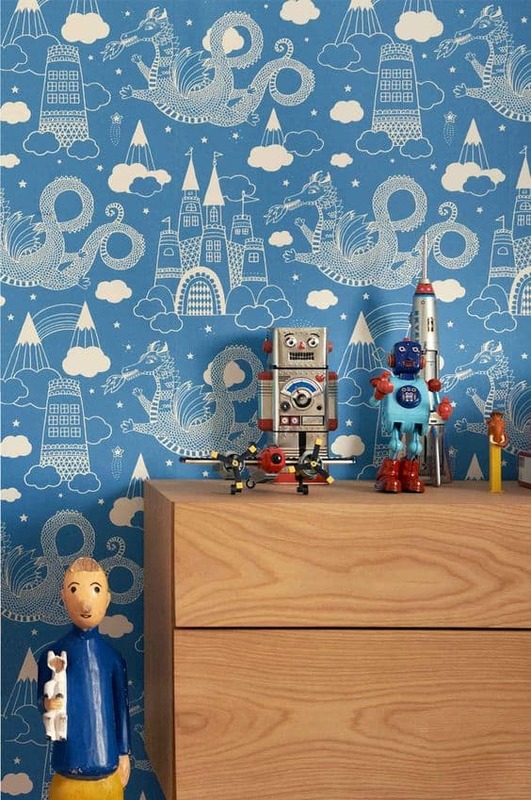 Kids rooms are the perfect excuse to go a little wall paper crazy. And if you use peel and stick – you can easily swap it out as the kids outgrow it. 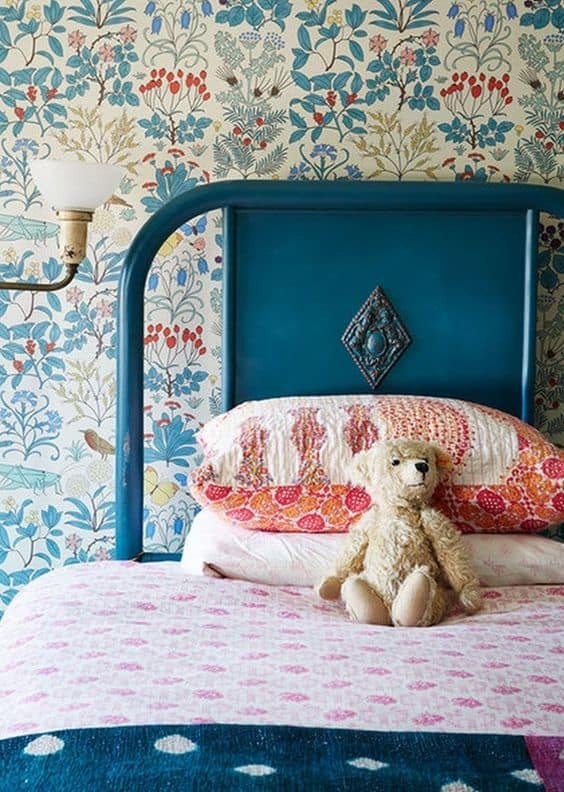 If you are scared to commit – try adding a little wallpaper to a book nook or desk area or just an accent wall. It’s not overwhelming and just makes those accessories and artwork POP. Kids Wooden Toys – the wooden toys look best IMO. Or the Vintage ones. It has a more collected feel to me. 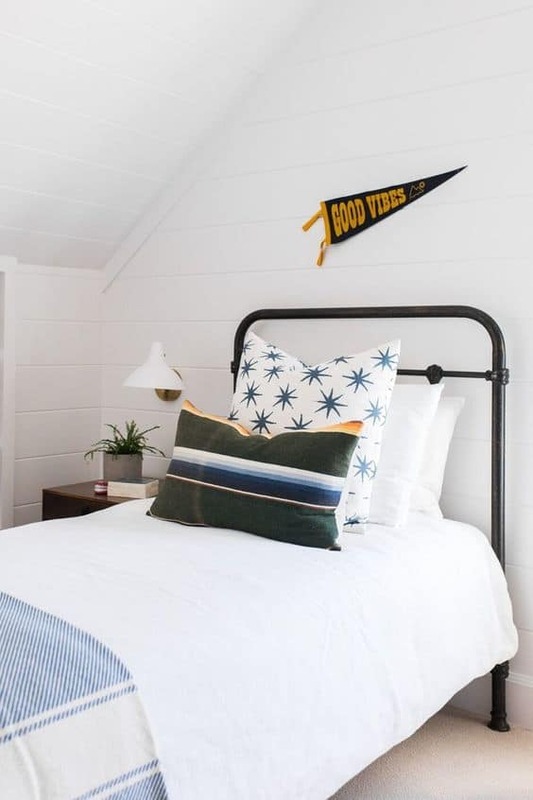 Bedding – yup the right bedding can add so much to a room. Going the paint route instead? 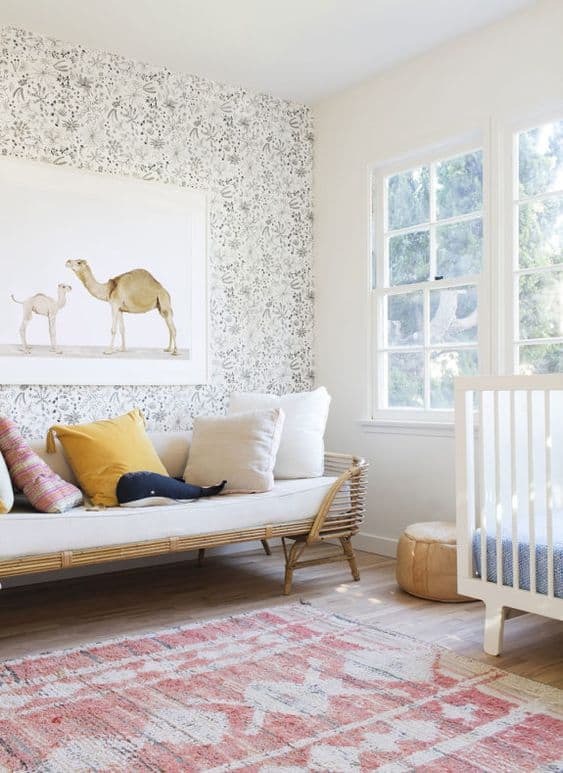 Here are some of the best paint colors for kids rooms. These are relaxing and calming. Let’s be honest, we all need more of that. Kids rooms can be hard to organize. Invest in pretty storage baskets. I like the baskets to be tiered in size and corralled together to create a little vignette. Use floating shelves to display books while also storing them. These look so pretty too. IKEA’s spice rack is a great solution for this. Take advantage of hidden storage. A simple canvas pocket organizer hung behind the closet door can hold barbies, stuffed animals, etc. Magnet strips can hold matchbox cars and look pretty darn cool on the wall. Declutter. You knew I had I to say it. Kids can feel overwhelmed in a space with too much stuff. 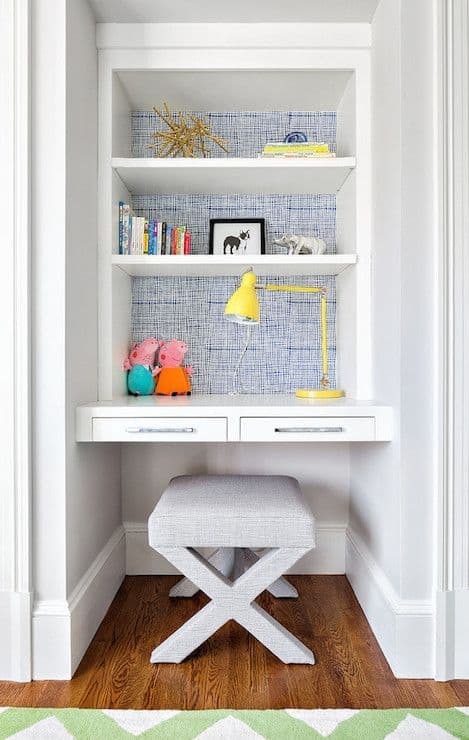 I think every kids room needs a little desk area where kids can create and draw or do homework. IKEA makes children’s desks that are too cute. Get a height adjustable chair to accommodate your growing child. Dealing with a small space? Utilize Vertical Space. Loft the bed and put a desk area underneath. I don’t know any kid who wouldn’t love a set up like this. Pottery Barn has a really pretty set! What about shared Kids Rooms? I shared a room with my sister growing up so this challenge hits close to home. I know it can be hard to make sure each person gets their own space, especially as kids get older. You can only do so much depending on the size of the room. First and foremost, I would definitely recommend separate beds! (My sister and I actually shared a queen bed growing up!) Either two twins with a chest of drawers in the middle or bunk beds work well. The single chest of drawers can serve as a nightstand for each while also visually separating the room. A set of shelves behind each bed can serve as each kid’s own “space” to store their stuff. Use bookshelves (like the IKEA Kallax) or tall wardrobes to help divide the room. Keep the room looking cohesive by choosing the same or similar bedding for each bed. 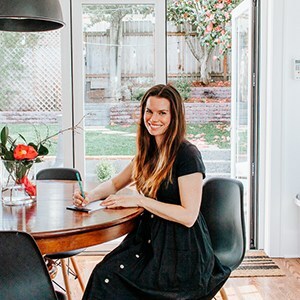 For even more inspiration – follow me on Pinterest!